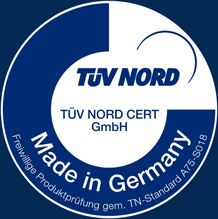 On 30/11/2011, after a successful review, VKK Standardkessel Köthen GmbH received the “Made in Germany” certificate for certified proof of origin from Dr.-Ing. Guido Rettig, Chairman of the Executive Board of TÜV NORD AG. “With the ‘Made in Germany’ certified proof of origin, we want to show our customers in Germany that we are rooted here and that we will continue to be at their side as a partner at our locations in Köthen and Duisburg. And the quality seal will strengthen our exports worldwide”, explained Lothar Velde, Chairman of the Management Board, who received the certificate at the production site in Köthen. VKK Standardkessel Köthen GmbH provides steam and hot-water boiler plants worldwide for industrial thermal power plants and energy supply companies. The steam boiler plants are an indispensable component of the power stations, for example in the automotive, paper, textiles and food industries as well as the chemical industry. VKK STANDARDKESSEL’s strengths include meeting individual requirements of economically efficient steam boiler plants as well as the provision of turnkey energy generation plants from one source.